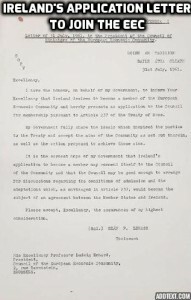 Irexit: An Antidote To A Flawed Contract? Politicians love the European Union – because they’re well rewarded by this undemocratic quagmire that’s been undermining Ireland economically, socially and culturally for decades. However, Brexit has demonstrated that ordinary Europeans will no longer tolerate an institution acting against the best interest of their country. The perception in Ireland is that our EU membership has brought prosperity and growth to Ireland. But has it? Has it improved living standards for all? Has it made us into a more equitable society and decreased the gap between rich and poor? The spin doctors, academics and our pro-EU media would gave an affirmative answer to all the above questions. But in reality, the corrosive and negative impact of the EU are shied away from. We can no longer really control our national debt. In the old days we could print our way out of debt and devalue our currency as the need arose. 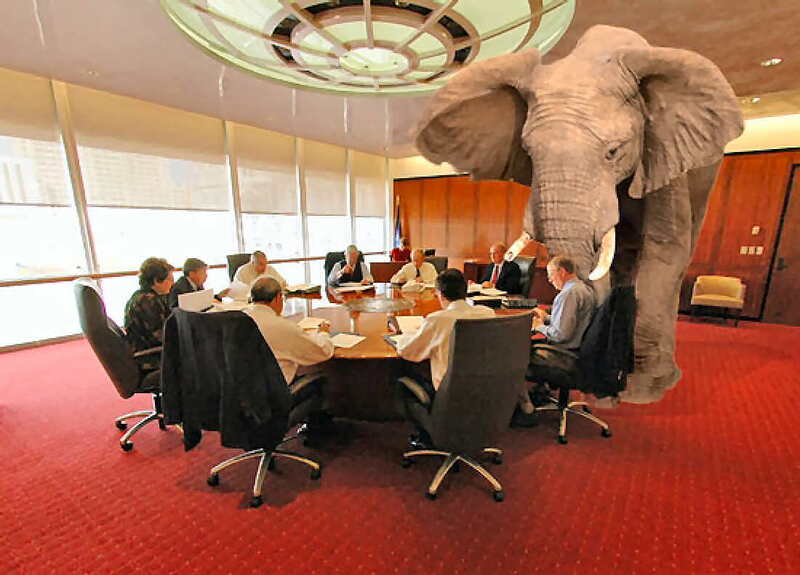 Crucially, we had the power to set our own interest rate. Alas, the European Central Bank and our membership of the Euro means we longer have this get out of jail card. We just didn’t surrender our sovereignty to the EU– but our financial independence as well. We gave all of our fishing rights and control of our national resources to Brussels. Incredibly, Luxembourg hasn’t an inch of coastline, yet it boasts a substantial fishing fleet? I wonder where they do most of their fishing? On a final point, we can also thank the EEC for the collapse of the Ford vehicle assembly plant in Cork followed by the closure of the subsidiary Dunlop tyre factory. Still think that Brussels is acting in our best interests? A referendum to leave the EU would be in the national interest, an Irexit, so to speak. As you’ve probably gathered, I believe we must leave EU to secure Ireland’s future. Below are some points that underscore my argument to leave the EU, because the contract signed in 1973 bring us into Europe is now null and void! 1. Full Disclosure – We were told that it would be just a trading agreement that would facilitate the free movement of goods, people and services between member states. It was never meant to morph into monetary union and a bureaucratic mess with a myriad of laws impinging on our personal freedoms. It was sold on the idea that it always would be a large tariff free trading pan European trading area – pure and simple! We were never party to its true future nefarious agenda of population displacement and replacement plan for a future Europe. Coudenhove Kalergi Plan – Regarded as the inspirational father for the modern EU. Richard C. Kalergi, according to Wikipedia, proposed Beethoven’s Ode to Joy as the music for the European Anthem. He also proposed the future European would not be white, but be of mixed race. Furthermore, he envisioned the Eurasian Negroid will replace every sovereign white nation- state. To achieve this he proposed flooding Europe with African Negroids and Asian Mongoloids. Thus no more Irish, French, German or Italian nations etc. Borders, national identity and the white race would be completely obliterated forever. Put simply: to displace, replace and expunge the native indigenous European Caucasian population. 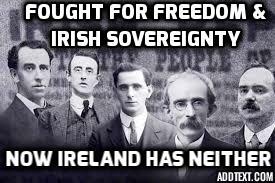 It’s basically a modern version of the 17th century Plantation of Ulster – history always repeats itself! It’s no surprise that the latest recipient of the KALERGI Prize was none other than Angela Merkel. To put it bluntly (according to the UN and the Dalai Lama) this is genocide. 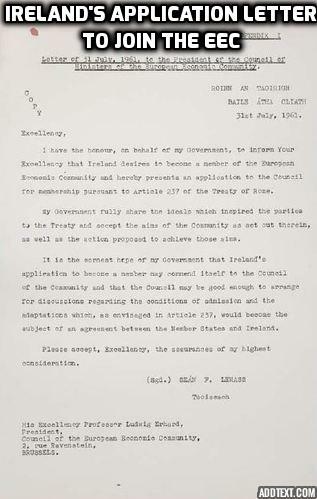 Crucially this information was not disclosed to the Irish electorate before the 1972 referendum to join the EU. If it was, I’m sure few would have voted to join the EEC. The UN’s Agenda 21 is now continuing this legacy of population replacement and displacement – a more sophisticated version of Kalergi Plan. Just as the EEC was sold to us as simply a large trading block. Similarly, Agenda 21 is masquerading ostensibly as a policy to protect the environment. Looks like history is repeating again. Will we learn our lesson this time, or just blindly and unquestionably accept Agenda 21, because the UN tells us it’s in our best environmental interest. Just like we wholeheartedly embraced the EEC because it was in our economic interest. Ironically, Saudi Arabia, a staunchly Islamic country, refuses to take a single fellow Muslim refugee into their super wealthy country. 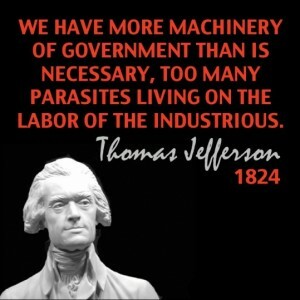 The same applies to their mega rich Arab neighbours: Quatar and Kuwait. Some European countries are now at breaking point with this unprecedented influx of young migrant men. Europe’s largesse is no longer economically or socially sustainable. Shouldn’t the main protagonists in the present Syrian conflict, i.e. 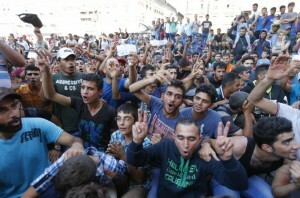 Saudi Arabia give refugee to these displaced people – thus easing Europe’s burden? 2. Equal Consideration – Jack Lynch, watched intently by Pat Hillary, inadvertently signed away the family silver. 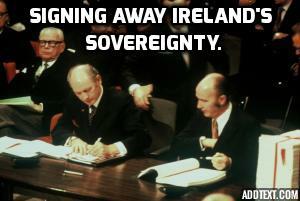 When Taoiseach Jack Lynch, signed the Treaty of Accession in 1972 he brought us kicking and screaming into full membership of the EEC in January 1973. Did we do well out of this contact? According to contract law: every contract must have equal consideration on either side. Both parties must have something to lose or risk. The EEC brought little of substance to the table. Whereas, we brought actual physical resources: our seas, our green pastures and our mineral resources. In return we got debt based paper fiat currency of little substance. 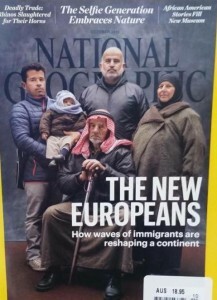 Also they gave us (secreted within their Trojan Horse), a future population replacement agenda: The Kalergi Plan. In the good old days, people used to replace the government, but now it seems the government is replacing the people! 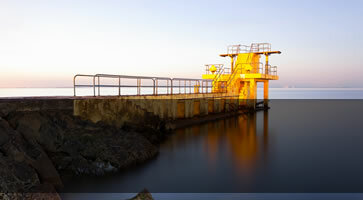 You only have to drive round Galway city to see the fruits of this plan. We Galwegians will be a minority in our own city by 2050. Already the native Irish are minority in Ballyhaunis, Co. Mayo. 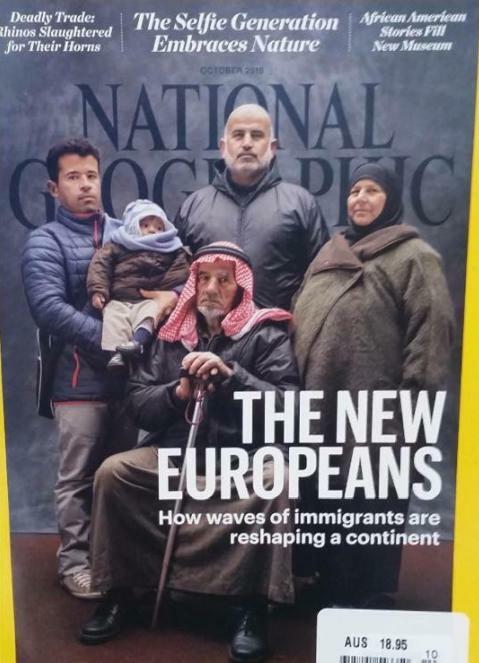 Fast forward a hundred years and Africa and Asia will still have their indigenous population, but Europe won’t. So you see, our current contract with Brussels is no longer fit for purpose because the basic constituents of a legally binding contract are not in place. The only thing that’s valid about our current EU contract is that it contains two wet signatures – not good enough! Brussels is slowly destroying Ireland: socially, politically, economically and culturally. Instead of abolishing our very necessary Eight Amendment, let’s delete forever the Third Amendment from Bunreacht na hÉireann . Time to say goodbye to this centralized quagmire of bureaucracy #IREXIT. Wouldn’t that be the greatest tribute we could bestow on the men who sacrificed their lives for Irish freedom in 1916?